Pelling is located in the state of Sikkim and is widely regarded as one of the friendliest and the most beautiful places in Sikkim. From the geographical point of view, this beautiful little town is somewhat located amidst the Himalayan and the Karakoram ranges. The town receives fresh snowfall every winter and hence, a visit during the winters can also be an excellent idea indeed. This article is written in the form of a Pelling travel guide. If you are considering a visit to this wonderful little town in Sikkim, you may benefit tremendously from this article. So let’s begin without further ado. So what’s the best time to visit Pelling? Pelling enjoys a pleasant weather during this time frame. The skies are usually clear and you might also get a decent view of the mountains quite easily from the very comfort of your hotel drawing room. You can’t ask for more; can you? Pelling exhibits exceptionally pleasant weather during this period of the season. If you plan for a visit, this should be the apt time to go. Note: If you are a snow lover, winter should be the apt time for you. There are many. We are just highlighting a few that you should not miss at any cost. Take a peek. This monastery was built in the seventieth century and is considered an important pilgrimage spot for the Buddhists. A trip to the Sangachoeling Monastery will take you through a dense forest and a rocky terrain. The scenic beautifies are absolutely breathtaking. Do not miss it. This bridge is the highest bridge in Sikkim and is also widely regarded to be the second highest bridge in Asia with an elevation of more than 198m above the ground. With lush green hills and breathtaking scenes all round, this spot should be a must on your “to visit” list. It’s also not too far away and is just around 28kms away from Pelling. Go for it with your eyes closed. The Rimbi waterfall is considered one of the most beautiful places to visit in Pelling. The beautiful scenery around the falls will be a definite treat to the eyes; there’s simply no doubt about it. So if you want a picture-perfect photograph, this is your place to go. The Rimbi Waterfall also provides tourists with options to engage in recreational activities such as fishing and swimming. Give them a go if you are enthusiastic enough. You won’t regret it for sure. Note: The best time to visit the Rimbi falls comes during the summers or the winters. It’s advisable to avoid going for the visit especially during the monsoons because of the tremendous rise in current. So keep that in mind while planning for a trip. This is the place where divinity blends with tranquility to provide you with an exceptional experience that you may actually remember for the rest of your life. The Khecheopalri Lake is considered to be one of the most sacred Buddhist places in Sikkim. “Wishes come true here”- This is a commonly held belief that’s primarily associated with the Khecheopalri Lake. So how can you miss a place like that? It’s a must for sure. 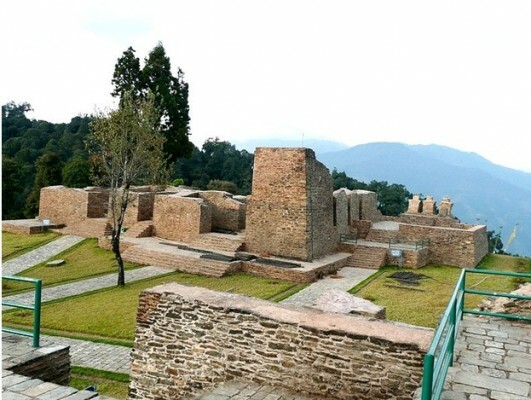 Your Pelling visit would be incomplete without a visit of the Rabdentse Ruins. So make sure you don’t miss that. So what are you still waiting for? Book a Pelling Tour Package NOW. This is your chance to make some memories. So get on it without further ado.